The 4th foxhole meeting focuses on contemporary literature. foxhole meetings aspire to assist independent curators and self-organized entities; the project is interested in creating and supporting its own safe zone or “foxhole” of self-sufficiency in Stockholm. Please join us for a literary evening of reinterpreted myth and lore, as three English-language novelists—Emily Breunig, Angela Mi Young Hur and Adnan Mahmutović—read from their work, inspired by folktales, legends and myth from Bosnia, China and Korea. 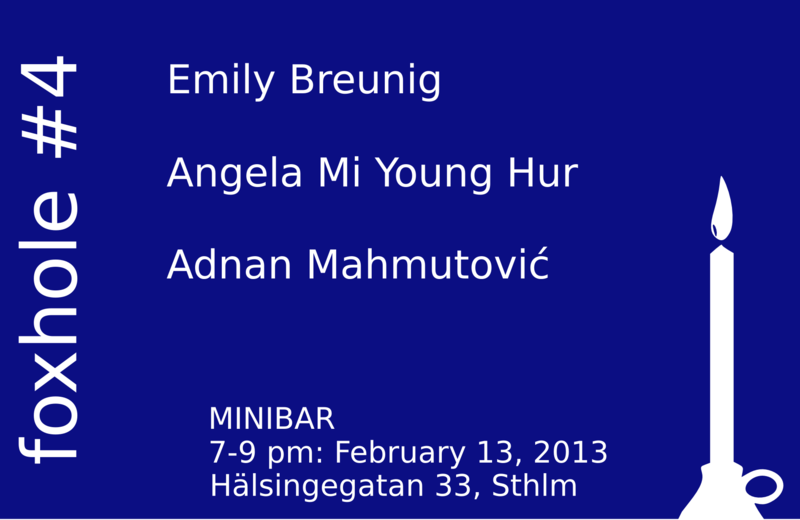 The authors will “perform” their excerpts, thereby returning their literary texts to the original context of oral literature in Minibar’s interactive space. Cross-cultural as well as cross-genre, this event aims to explore how stories around the world continue to evolve as writers appropriate across languages, cultures and genres; to recreate storytelling in its most elemental form as a relationship between the teller and listener; and encourage writers, readers and curators to engage with literary text in contexts both old and new. This meeting will address these questions, among others: What is gained or lost when literary art is presented in a shared public space for an audience? How does the experience of literature compare to an individual’s engagement with a text? What if the literary text is an appropriation of a traditionally oral art, such as a ghost story or folktale? What does it gain or lose when returned to its original context? How does a reader versus listener perceive a textual reading as opposed to hearing it performed? How does this inform a curator’s approach to presenting literary work in a non-textual setting—what potential can be mined from the performance of a text? What challenges present themselves for the writer, curator and audience? Angela Mi Young Hur received her A.B. in English Literature from Harvard and her M.F.A. in Creative Writing from Notre Dame, where she was the Sparks Fellow and Managing Editor of the Notre Dame Review. She was then awarded the Sparks Prize: a year-long writing fellowship. Her first novel The Queens of K-town (2007) has been taught at U.C. Berkeley, University of British Columbia and University of Seoul. From 2008-09, she taught English Literature and Creative Writing at Hankuk University of Foreign Studies in Seoul, Korea. An excerpt from Folklorn, her novel-in-progress, was presented at UBC and published in Stockholm University’s creative writing journal Two Thirds North. Additionally, she has published book reviews, author interviews, essays and has worked as a screenwriter, editor and copywriter in Stockholm. Angela Mi Young Hur is represented by Foundry Literary + Media. Adnan Mahmutović (b. 1974) became a refugee of war in 1993 and ended up in Sweden. He worked for a decade with people with brain damage while studying English and philosophy. Mahmutović has a Ph.D. in English Literature and M.F.A. in Creative Writing; he is currently a lecturer and writer-in-residence at the Department of English, Stockholm University. His stories have dealt with contemporary European history and issues of identity and home for Bosnian refugees. Emily Breunig will be reading from her recently completed novel A Ghost at the Edge of the Sea, a coming of age ghost story set in Shanghai dealing with questions of identity, dislocation, memory and culture clash. After losing his father, Will, a recent American college graduate, jumps at the chance to escape his old life and begin again in China. But once he arrives, he finds that Shanghai is not quite the city he expected it to be—nor are people from his past life content to stay dead. A Ghost at the Edge of the Sea also explores the complicated gender, linguistic and cultural tensions that Will encounters in contemporary Shanghai. Breunig will read an excerpt from her novel in order to catalyze discussion about what displacement and self-exploration means in this globalized, fractured world. Angela Mi Young Hur will be reading a reinterpreted Korean folktale from her novel-in-progress Folklorn, which explores themes of inheritance—cultural, genetic and property—and incorporates Korean myths and folktales told in first person, “confessional” monologues. These revisionist folktales are anchored in a more personalized P.O.V. for dramatic and literary purposes, and to reveal the psyches of two major characters in the novel: the mother who believes herself to be a descendant of the original folktale heroines and thus destined to repeat their narrative lives, and her scientist daughter who wonders whether she is fated to lose her mind or her free will. The author will read one of these folktales and return a literary text to its original context of oral art and performance. Following this, she will discuss why and how she used folklore to explore themes of mental illness, migration and destiny. How to Fare Well and Stay Fair is full of raw, intimate portraits of Bosnian stories about longing and survival, from Bosnia to Sweden and still further, toward an ever-elusive idea of home and homeland. There is a mix of funny stories about sad refugees and sad stories about funny refugees— all of them full of denial and pretence and hope and putting the past away and never really letting go. Almasa, the main character in most stories, is feisty and funny, and she suffers no fools. She will go to any length to take charge of her broken life and avoid being labelled a victim. Each story, although compact and unique on its own, is tied to all other stories—chronologically, emotionally or thematically. Together, they probe the margins of our contemporary history and give voice to people pushed to the edge of life. Adnan Mahmutović will read excerpts from two stories: “Vacation: A Travelogue” and “Integration Under the Midnight Sun.” Each piece puts two European cultures in dialogue and rethinks the notions of individuality, community and integration; these stories try to create a sense of pious-heresy in the relation between individuals and their complex cultures.